Thanks for the clarification. It's a shame that SDL 1.2 support was dropped before C64 emulation got added. As for Dizzy I'll probably try them anyway at some point, but are they as bad as LJN games, Big Rigs, Hong Kong 97 and CrazyBus? Or are they just bad because they're unforgivingly hard/impossible to beat without the guide? As for Dizzy I'll probably try them anyway at some point, but are they as bad as LJN games, Big Rigs, Hong Kong 97 and CrazyBus? Or are they just bad because they're unforgivingly hard/impossible to beat without the guide? They are not that bad but they are very unforgiving and they don't give you any clue to where you need to go, i hate this kind of game. So guess what guys ? That puzzles me... Why ? I will upload the source code for both emulators on github but fortunely, i was able to port another emulator. Yeah, that's an Apple I emulator. I must say that the Apple I was a very primitive computer compared to even its sucessor. Porting it to TI nspire was not easy and it took me a while to get things working. you have access to everything else, including the 8k RAM expension. EDIT: Fixed the key mapping, might work faster on CR4 revisions. EDIT2: Now working properly on CR4 revisions. Can we load other ROM files than Basic ? I've noticed I don't need to tell the emu about the "basic.rom" file and just have to type "E000R" tun run Basic, so I wonder. I've also noticed the Basic is a 4K ROM file, when all ROMs sites I could find up to now are providing much bigger WAV files.  I honestly don't know but it doesn't seem to designed to load other roms. Unfortunately, the keymap doesn't seem perfect. I've even tried the ctrl+shift key modifiers but they don't seem to change anything at all. Wow, this looks great! Would an Apple ][ emulator be possible, or is it too "advanced" for the Nspire? Could please tell me what the "()=;<>:" keys are mapped to in ndless ? Quote Wow, this looks great! Would an Apple ][ emulator be possible, or is it too "advanced" for the Nspire? It should be entirely possible, thanks to the TI nspire keys. You may map : to KEY_NSPIRE_FRAC . Nice to see an Apple 1 emulator on the CX. But that screenshot... 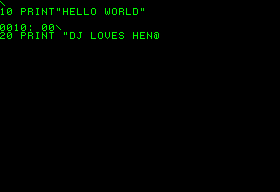 It says "DJ LOVES HEN@"
To type either "<" or ">", hold Ctrl or Shift and then press the "()" buttons. Also critor, can you please test it on a TI nspire CR4 revision ? Quote It says "DJ LOVES HEN@"
Yes, it's faster on CR4. It doesn't trigger the compatibility mode anymore, but the display is wrong though. ^ I've just opened pom and typed 0123456789. Just test on Firebird ? Ha, didn't know that, thanks. EDIT: Anyway, it's fixed now, thanks to firebird.